Last week's Sermon message was titled Restore Us, O God: Hope. It's the first of a four week series during the season of lent, and will follow the four Advent themes of hope, joy, peace, and love. This week was hope. Where do we find our hope? On what do base our hope on? Using Psalm 80 as a backdrop, we explored the need for hope, and the source of our hope. Today I spent an hour in front of Wal Mart ringing the bell for Salvation Army. I helped through our local Christian Motorcyclist Association chapter, who rings the bell on Black Friday every year. But even if they were to stop for a year, I would still help. I love it. It's a great cause and I'm glad to be a part of it. When you walk by a red kettle, please donate. And better yet, when you get some time, give Salvation Army a call and volunteer for an hour. You'll be glad you did. I know I was. Almond Union of Churches was a relay center for Operation Christmas Child again this year, and had set a new record for the number of shoeboxes collected at our church. As a Relay Center, we collect shoeboxes from area churches, groups such as boy scouts or girl scouts, junior grange groups, even businesses and individuals. As we receive them, we carton them up and transport them to the collection center in Big Flats (Big Flats Wesleyan Church). When we drop them in Big Flats, we put them onto the big Roadway semi-trucks and they go to Boone, North Carolina. From Boone they are processed then distributed to some of the neediest children in the world. But before they get distributed, each shoebox gets a gospel story book, so that as children get a shoebox gift (for many, it might be the first gift they've ever received), they will also learn of the greatest gift of all, Christ's gift of salvation. This is an incredible ministry, and I'm proud that Almond Union has embraced it and works so hard every year to make it a success. This year, we collected 774 shoeboxes. Perhaps just as impressive is the fact that we had 24 volunteers working 121 hours. Yet I don't think anyone thought it was work. We have fun serving together. And we made a difference! 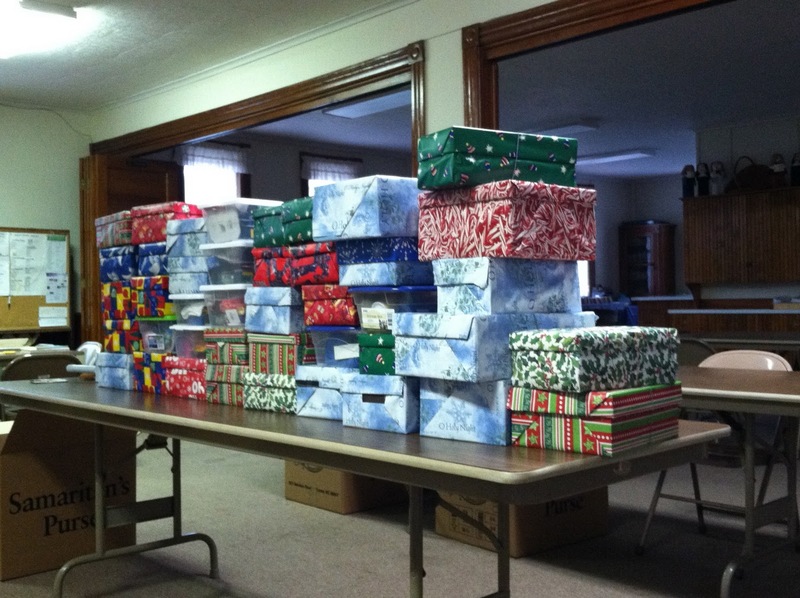 Thank you to everyone who helped, who donated a shoebox, and who prayed over the shoeboxes that were collected. Your efforts are appreciated. On the Churches FaceBook page, we have pictures of the event. Feel free to check them out at Almond Union of Churches FB. Last week's Sermon message was titled Sheep & Goats. 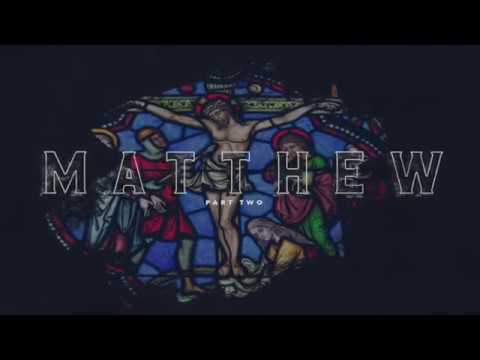 We looked at the lectionary reading last week from Matthew 25:31-46. This is the passage where Jesus promises that at the end, He will separate the sheep from the goats. The sheep will come with him into the kingdom of heaven, while the goats will go into the lake of fire. What was the difference between the two? Was it faith? No. Both groups had faith. It was works. The people who made a difference in the lives of others were counted as sheep. The ones who helped others meet their basic needs were the ones counted as sheep. The message looked at this. Paul says we are saved by faith and faith alone. What then is the lesson here? I don't usually do this, but this post was something that made sense to me, so I wanted to share it with you, and maybe get your comments on it. It's from Our Daily Journal, a daily devotion from RBC Ministries. Academic education is important, but I wonder, Is equal—if not greater—attention given to instructing our children to become men and women of high moral character? People imbued with a clear purpose and mission in life? And God is the best teacher with the best lesson plan for us to follow. First, we teach by example. Parents must “commit [themselves] wholeheartedly to these words” of God (Deuteronomy 11:18). He states, “Lay up these words of Mine in your heart and soul” (ESV). Yes, God’s Word must personally shape our heart, mind, and will. Second, the place of education is not in the classroom, but in the situations of life (Deuteronomy 11:19-20). So it’s good for us to ask: Are we seizing opportunities to turn life experiences into teaching moments? Are we freeing up the quality time that’s required? Whether you’re a parent or perhaps—like me—you’re an aunt (or uncle) to some precious children, let’s take their education seriously. 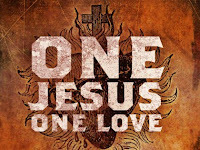 We must instruct them to “act justly and to love mercy and to walk humbly with [their] God” (Micah 6:8 NIV). Love to hear your comments! Thanks for reading. Rick Warren had posted on Twitter about a Wall Street Journal article published on August 26. It was written by Rodney Stark and Byron Johnson, and it was titled Religion and the Bad News Bearers. The story is primarily concerned with how the news media tends to pick up on trends and surveys that are negative to the church, but don't seem to notice those that are positive for the church. I guess we all know that unless it's bad news, it doesn't get covered, but I guess I didn't realize how much so. The article also spoke of women in the church, young evangelicals remaining conservative like their parents, and other trends in the church that were reported in negative terms. In reading this, perhaps the church is doing better than I feared. There are so many conflicting stories out there, it's hard to know what to believe. But you can believe this: Remain faithful, stay in the Word, pray daily, be an active part of the church, and the rest will work itself out. Last week's Sermon message was on How Not to Shorten Your Life. We talked a little about those people that irritate us, that annoy us and get under our skin. We even saw some evidence that people that that high strung personality don't live as long. But then we see in Scripture that we have nothing to fear - niether about not living long, or about those people who take everything so serious ruining our day. There are three tips from 1 Thessalonians 5:1-11 that can help us with that. By the meekness and gentleness of Christ, I appeal to you - I Paul, who am "timid" when face to face with you, but "bold" when away! I beg you that when I come I may not have to be as bold as I expect to be toward some people who think that we live by the standards of this world. Have you seen this verse before? Have you considered it? I'm thinking of the last part of it. To put it in context, Paul is writing the Corinthians, and is nearly at the end of his letter, telling them he is planning to come back to Corinth a third time. But it's not all good news. He's coming back because he's heard of things that are happening in the church in Corinth that are not good things. And we can see in this passage that one of the things is that the people in the church, at least some people, are living by the standards of this world, and not the standards of the church. There should be different standards. We, as followers of Christ, seek to imitate Christ. He is our standard. That's a much higher standard than the world. If we can be successful in living to that standard, we will be different. We will stand out. We will have something unique that those living to the standard of the world will want. We will have the power of God. Unfortunately, we don't always do too good at living to that standard. Is it because it's too hard? Is it because we don't see the value? Is it because we have lost our first love? Is it because our faith is weak? Whatever it is, we can do better. We can be people of faith. We can cling to Jesus our Master. We can follow His example. We can live His life. We can experience His peace. We can be comfort and compassion and love in the world around us. Not in ourselves, but in Christ. Don't live by the standards of this world. There is something so much better within your grasp. 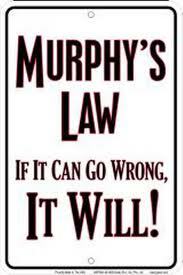 Last week's Sermon message was on Murphy's Law. We talked a little about what it is and how we've all seen it lived out in our lives, then we looked at an example from Scripture, and how we can learn from that. My loved one had a vineyard on a fertile hillside. He dug it up and cleared it of stones and planted it with the choicest vines. He built a watchtower in it and cut out a winepress as well. 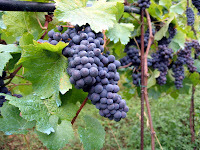 Then he looked for a crop of good grapes, but it yielded only bad fruit. At the end of this story, he told what he was going to do. He (the Lord) was going to send people in to trample on and destroy the vineyard, to make it an utter wasteland. Starting in verse 8 there are a series of woes to the people of Israel and Judah, six of them in all. Then begin prophesies of Assyria descending on Israel and Judah. We know that happened. Israel and Judah were invaded, many of the people taken back in exile. All this because the Lord found them unfaithful and unfruitful. In the midst of these verses, we see Isaiah 6:13a, "And though a tenth remains in the land, it will again be laid waste." 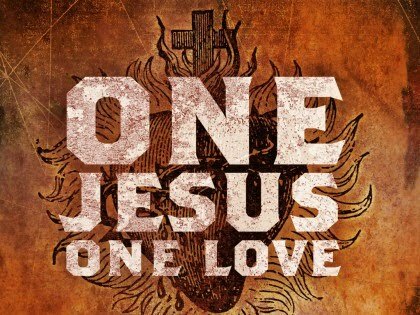 Here’s my concern: In Romans 11:17-20b, we see.. If some of the branches have been broken off, and you, though a wild olive shoot, have been grafted in among the others and now share in the nourishing sap from the olive root, do not boast over those branches. If you do, consider this: You do not support the root, but the root supports you. You will say then, “Branches were broken off so that I could be grafted in.” Granted. But they were broken off because of unbelief, and you stand by faith. As I read this, has the Church of Christ become the vineyard of Isaiah 5? If so, are we doing any better in the 21st century American Church then Israel and Judah did? I read that only about 15% of American’s attend church, and I know that in my community, that’s about right. But though a tenth remains in the land, it will again be laid waste. How do we stand? How secure is the church we love? In the end, it depends on each of us. The church is as strong as it’s members. The whole is equal to the sum of its parts. When God looks at us, will he find us faithful and fruitful, or ready to be trampled on and destroyed?